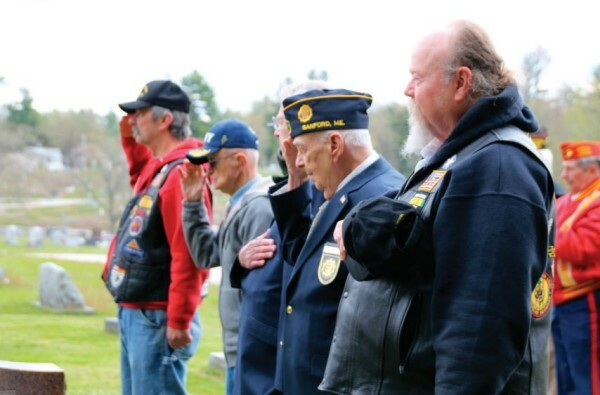 Veterans paused Monday during a ceremony in memory of Richard Wormwood, who was listed as missing in action during the Korean War. A memorial plaque for Richard C. Wormwood was installed in the his familys plot. SANFORD, Maine — He was a beloved son and a beloved brother. And in 1951, when he was 21 years old, U.S. Army Cpl. 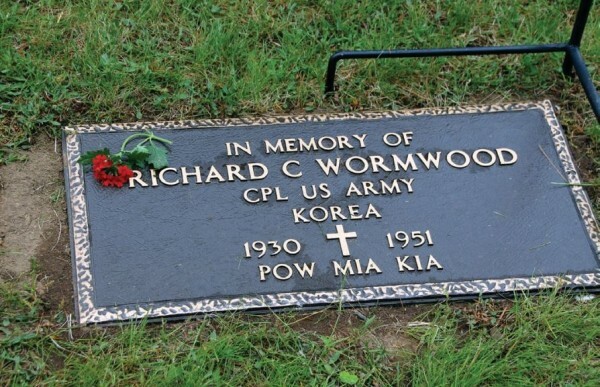 Richard C. Wormwood was reported missing in action while fighting in Korea. For more than 50 years, that’s all his family members knew, despite their ongoing search for answers. Wormwood was a son to Henry and Geneva, and a brother to Margaret, Noreen, Robert and Clifford. The young man worked as a printer’s “devil,” or apprentice, for the Sanford Tribune until he went off to fight for his country in that faraway land. “After he was missing, we kept getting letters back we’d sent to him, marked ‘MIA,’” his sister Margaret recalled on Monday. Each letter reopened the wound of not knowing, of wondering, of longing to know the answers. Years later, his parents and his brother Clifford died, still not knowing the fate of their son and brother. Then, while at an MIA conference in Washington, D.C., in 2002, his sisters received a packet containing the information their family had sought for more than 50 years. On May 18, 1951, Wormwood was among 22 men from his unit who were captured or listed as killed in action or missing in action. Wormwood was among those captured and marched to North Korea with other prisoners of war. It is the family’s understanding that the men were marched about 70 miles. Wormwood was weak and ill with dysentery, so his fellow prisoners helped him keep up until he could go no further, Margaret said. He was escorted from the column and not seen again. Margaret said one witness reported hearing a shot. The military had had information about what happened to Wormwood since 1953, according to Joe Doiron of the Great Works Foundation Fallen Warriors Project, which helped secure a bronze plaque honoring Wormwood for the family burial plot. No one knows why it wasn’t revealed to the family. On Monday, Margaret, Noreen and Robert joined with folks from the Fallen Warriors Project to honor their brother at a ceremony at the family plot in Oakdale Cemetery, where the plaque had been laid. Vases of fragrant spring lilacs and other flowers graced the headstone of his parents. Sanford Junior High School student Angela Suresis, a member of the school’s Adopt a Grave program and the school band, led the service. She told of Wormwood’s story, and announced a wider project to honor all Sanford and Springvale veterans who died in the Korean War, similar to a World War II project conducted in 2015. Banners bearing the veterans’ likenesses will be hung along Main Street in the lead-up to Memorial Day, honoring Wormwood along with Wilfred Michaud, Paul Bergeron, Robert Mllington, Roger Collette, Donald Davis, Ralph Baker and Robert Conley. But that’s to come later. On Monday, it was time to finally give Wormwood the military ceremony he was due. Sanford High students who are members of the U.S. Navy Junior ROTC program based at neighboring Massabesic High School presented the colors. A color guard provided a three-gun salute. Students from the Adopt a Grave program — who were spending the day cleaning gravestones and planting flowers at World War II and Korean soldiers’ graves at area cemeteries — stood by silently as Pastor Todd Bell led the simple service. Veterans of World War II and ensuing wars stood, hands on hearts, in respect for one of their own. The family had hoped, one day, to secure their brother’s remains, but that was not to be. North Korea is not of a mind to allow searches. As the service concluded, family members wiped away tears. Robert Wormwood plucked a blossom and placed it on the plaque laid in memory of his brother. “It’s nice to have this here,” Robert said.